3 Reeds in 1 Call. Our most popular predator call for over 20 years. With just the twist of the mouthpiece, you have access to the long, medium, and short range voices needed for successful predator calling. Before you begin calling coyotes, you need to find a good location. 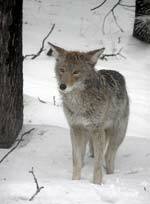 Look for coyote tracks and droppings around water holes, stream banks, game trails, and in soft dirt along the roads. Remember, you are wasting your time coyote hunting if there are no predators within hearing distance of your calls. When using your car to travel from one stand to another, park it quietly and in a low spot. Don't slam the doors shut as that will scare away animals within hearing distance. Always walk into the wind away from your car for at least 100 yards before taking a stand. Be as quiet as possible and take advantage of any cover there might be to conceal your approach. When choosing a coyote hunting stand, try to find a high spot that will hide you but also give good visibility in all directions. Predators don't usually look up into trees unless they are very close while you are actually calling. If possible, find a tree that you can comfortably sit in while using your calls and gun or bow. Do your best to blend into the natural cover of the area you are hunting in. Always call into the wind, but watch all points as a coyote may come from any direction. Coyote calling is poor on very windy days, but not impossible. When calling in high winds, watch mostly to both sides of downwind. Early morning and late afternoon is best for calling during hot weather. But coyote calling is good all day when the weather is cool. Don't get in a hurry to shoot when you see a predator coming in. Let him come closer for a better shot. Sometimes there may be two predators approaching. In this case, shoot the one farthest away first, then the closer one before he runs out of range. Our coyote calls are not meant to sound like a coyote, bobcat or fox. They are tuned so the caller can reproduce the cries of a trapped or injured jackrabbit, cottontail or small rodents. The screams of a rabbit in distress will carry the sounds of terror, pain, and despair. When using a predator mouth call, you must invoke the feeling of pain and despair into the sound of the call. The more terrified and frantic you can make the call sound, the faster a coyote will come. It is not unusual to have one or more come on a dead run after only a few screams of the predator call. However, the coyote might be a mile or more away so it is best to call 15-20 minutes at each stand. There is no hard or fast rule on the way a predator will come to the call, so you must stay alert. When calling in bobcat country you must be especially watchful as bobcats usually come in more cautiously than any other predator and will take full advantage of all available cover in approaching the caller. However, this is not a hard and fast rule as once in a while one will come in on a dead run. Bobcats are very curious and are apt to stand and watch the caller for several minutes, thus giving you a standing shot. Bobcats are more wary than other predators and if you call one and kill it or miss, there is very little chance of calling another from the same stand. Usually by the time a bobcat is seen by the caller, the cat has already seen him but his curiosity will cause him to remain longer than other predators would. Always take a good look at anything off color or different from the last time you studied a particular area. Take special notice of any small white spots as most bobcats have a white spot on their chests. You will call many bobcats that you will never know about, but practice will increase your percentage of cats called and killed. Coyotes probably provide more thrills and excitement for the caller than any other predator as they usually come in very fast and it is not unusual to call them within ten feet or less. When a coyote comes in warily, it is important that you remain very still because he can be stopped or called into a more favorable position. When a coyote is spotted coming in, it is best to stop calling and let him come because he has a good idea of the exact spot where the sound is coming. He will stop within easy range to listen for another scream from the rabbit he thinks he is after. This should give you an easy shot. 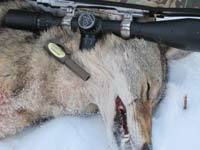 If the coyote is on a wrong course, or you want to stop him in a favorable position, give a low, piteous cry on your call or on your close range coaxer. Coyotes often run in pairs or even families, so if you call one and make a kill, keep calling. Strange as it may seem, the sound of a shot does not bother them nearly as much as movement or human scent. Fox are probably the greatest suckers of all for a predator call. Once you have convinced a fox that there is a rabbit in distress, you almost have to kick him in the teeth to make him think otherwise. 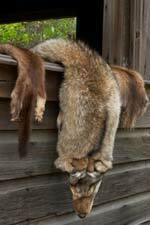 In fox country it isn't unusual to call and kill several, one after another. If you call a fox and miss or only wound him, keep calling because it's sometimes possible to call him back.